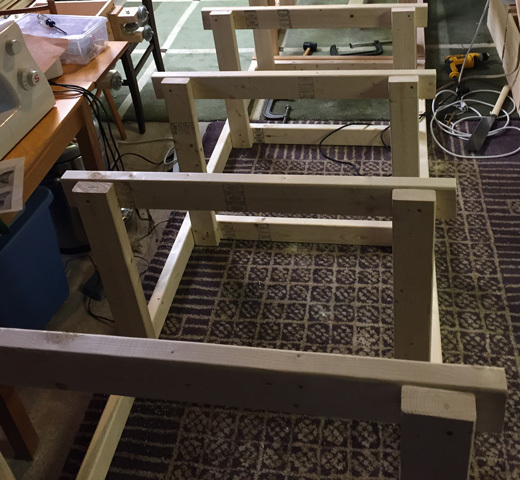 I built a kid-sized roller coaster in the basement! Here's the story. 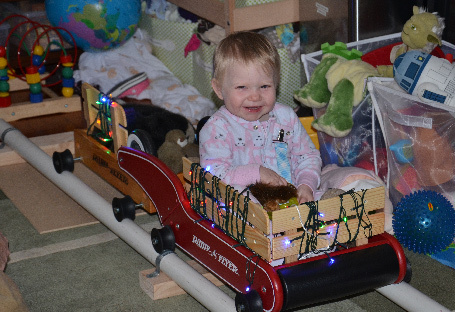 For the 2013 holidays, I had constructed a kid-sized railroad train for my daughter. I adapted the front car from a Radio Flyer Classic Walker Wagon and the rear car from an older model by replacing the wheels with CW4 U-wheels from CamOnWheels. The track consisted of two long PVC pipes, tied periodically by metal clamps affixed to wood beams. This train was pretty cool. Thanks to ball bearings in the wheels, it moved smoothly and was satisfying to operate. But it could only go in a straight line, and it couldn’t go very fast without risking derailment. I started thinking about the holiday train’s successor. 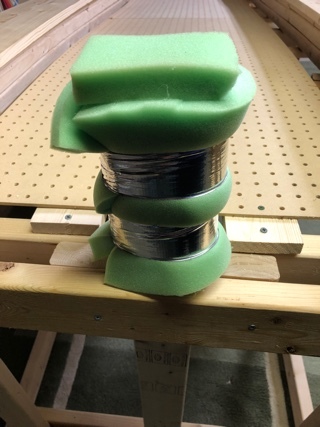 I had been impressed homemade roller coasters I'd seen online. Could I build a small one? I started researching roller coaster construction. I studied the photographs at coastergallery.com and johnnyupsidedown.com. I read books and coasterbuzz.com forum posts. There were still a lot of gaps to fill in, but I began to think I might be able to pull it off. I decided to build the roller coaster in the basement, so I could work at night and keep the resulting clutter to a minimum. Roller coasters have several wheels. Some of those wheels are positioned at right angles to one another, to keep the roller coaster on its tracks as it follows a curved trajectory. These wheels are typically grouped into assemblies. Wheel assemblies on pro wooden roller coaster cars are usually metal. I didn't have convenient access to welding equipment, so I chose wood reinforced with steel bolts. I'd attach four of these assemblies to my vehicle. For the actual wheels, I selected nylon inline skate wheels. Four of these wheels are strong enough to carry an adult. I'd also use four, but design my loaded vehicle to weigh a lot less than an adult. The wheels would need to accommodate at least the track thickness, which I set at 19 mm, based on available boards. I fired up SimpleCAD and came up with the simplest design I could. I iterated on it a couple of times until arriving at this. The guide wheels on the bottom and side never carry the full load of the vehicle. As a result, they can safely hug the track, exposing it to the brunt of their modest force. The top wheels, on the other hand, typically do carry the full weight (or close to the full weight) of the loaded vehicle. Consequently, they would sit on a laminated track support. The wheels are all bolted-in, and the bolts also serve as their axles. The side wheel's axle has to be in a different plane than the top and bottom wheels' axles. But since there are four wheel assemblies, the forces all balance out. On the diagram above, light gray is steel and dark gray is nylon. The olive rectangles are bolts and the red rectangles are inline skate spacers, which brace the wheel bearings. Most everything else is wood. The dash-outlined rectangles in the wood on the left side indicate pocket holes. They permit the wheel assemblies to sit flush against the vehicle, without interference from the bolt heads. The gray-brown areas on the righthand drawing indicate drill bores. The vehicle itself would basically just be a crate long enough for a kid to sit in. I'd assemble it from a series of wood slats mutually braced and held together by screws. Although some newer pro wooden coasters do have prefab metal tracks, most are still wood. Some homemade coasters use tracks made out of PVC pipes that have been heated, and then bent. But that produces toxic gas. I was also worried that cyclic strain would lead to mechanical failure over time. I made the decision pretty early on to go with wood. Wood is strong, forgiving and easy to work with. As much as I intially wanted to attempt a banked turn, the available space wouldn't really allow it. I eventually settled on a track path that would trace out a valley between two peaks in a single vertical plane. The vehicle would hang from its four wheel assemblies, threaded around the track. I picked a track support gauge (the distance between the two tracks) of 69 cm, to accommodate a typical crate plus a margin. I managed to find an industry handout on safety inspections that contained isometric drawings of the “ledgers” that tracks and track supports are built atop. I basically copied that design. It would need multiple reinforcing beams to safely support a 23 kilogram passenger at a factor of four margin of safety. Wherever possible I spread out loads in this manner, to eliminate single failure points. The design for the pitched track trajectory would need to be informed by subsequent testing. I ended up revising it many times over the duration of the project. I found most of the hardware I needed at the hardware store. An exception was the 10 cm long steel bolts for the top wheels, which also proved expensive. Luckily I only needed four of them. The lumber for the track and understructure came from my local Home Depot. Its quality proved uneven enough that I resolved to use a wholesaler on my next project. I learned to sift through entire lumber piles and revisit after restockings to find usable timbers. Originally, I had planned to use published product specs to determine how much load each component could handle. But I rarely was able to find any. Instead, I ended up having to conduct my own tests. For example, to ensure that the vehicle’s slatted wood bottom was up to 4 times the required load, I built a prototype and proceeded to jump up and down on it. It held. The track surface and support laminates would need to be bent to assume the shape of the valley. I hoped to accomplish this without the need to resort to steaming or notching. 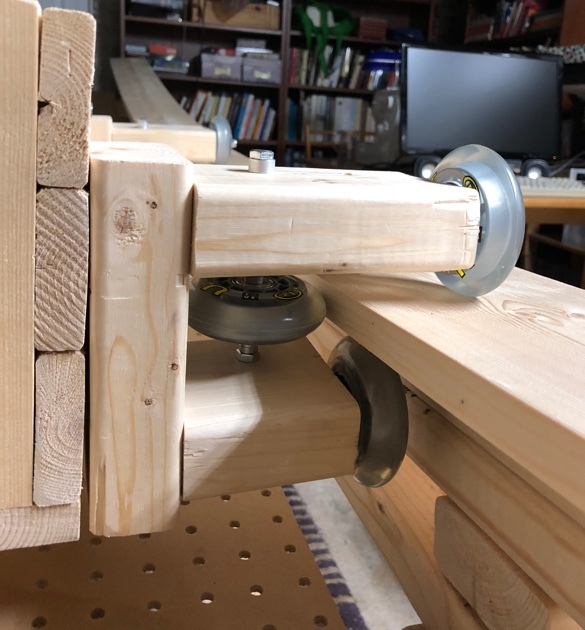 With essentially no prior woodworking experience, I was worried about bending the track timbers into place with clamps. How far could I safely bend them? If I bent them too far, would they suddenly snap, assaulting me with splinters and chunks of broken wood? So my original plan was to use thin laminate strips, which I figured would be easy to bend. They were. In fact, experiments showed I could safely bend them significantly further than I had supposed. Since the required number of strips would have been expensive, I decided instead to go with thicker “2 by” timbers. These did necessitate the purchase of special, monster-sized bending clamps, but cooperated afterward. So the track support ultimately consisted of a stacked laminate of pine nominal 2 by 4 by 10’s. I would secure them with a portable electric drill and staggered deck screws. Finally, I'd cover the ledger surface with bent peg boards. I started in on the wheel assemblies. It was hard to get completely straight cuts with my Japanese hand saw. Even after buying an engineer’s square, I ended up rebuilding the wheel assemblies several times to get them right. My design also involved very long bores that I kept screwing up with a hand drill. So I got a drill press. That helped, but the drill press didn't always have enough vertical clearance when its support tray was installed. So occasionally I had to replace the tray with a makeshift sub-base and/or drill from both ends, trying my best to meet in the middle. Lengthwise, the track surface consists of two separate boards and I could never manage to get completely smooth, first-order continuity at their contact point. But, to my surprise, testing revealed it not to be a serious problem. 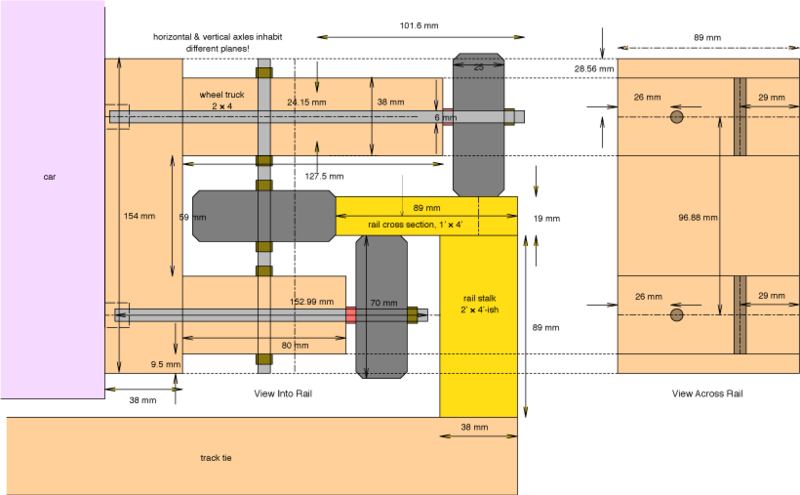 I needed many deck screws to complete the track understructure. I learned the hard way to consistently drill-out adequate holes for them ahead of time. 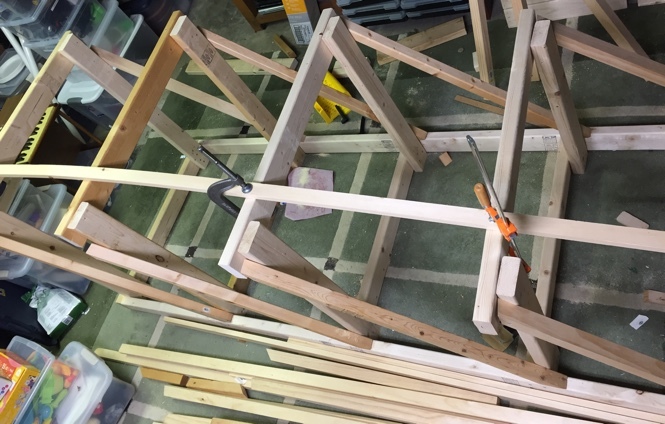 I'd always been too lazy to build a sawhorse for previous projects. During construction on this project, the incomplete ledger often served as one. Slightly inclined, but extremely secure. Once the peg boards were installed, I found I could actually lie down on the ledger! Maintaining wheel clearance along the entire length of the bent track required some contour adjustments and a lot of shaving. But once everything was planed down and the vehicle was reinstalled, it felt correct. I loaded the vehicle up with weights and did a test run. To my relief, it worked well. I couldn’t figure out how to attach seat belts to the vehicle without compromising its structural integrity. So instead, I opted for a padded restraint bar. I screwed wooden socket pairs into both sides of the otherwise symmetric vehicle, to accommodate different sized-kids. 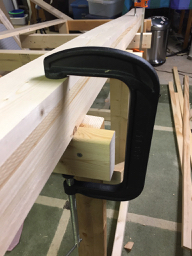 The dowel bar could be secured in these ports with a clamp. 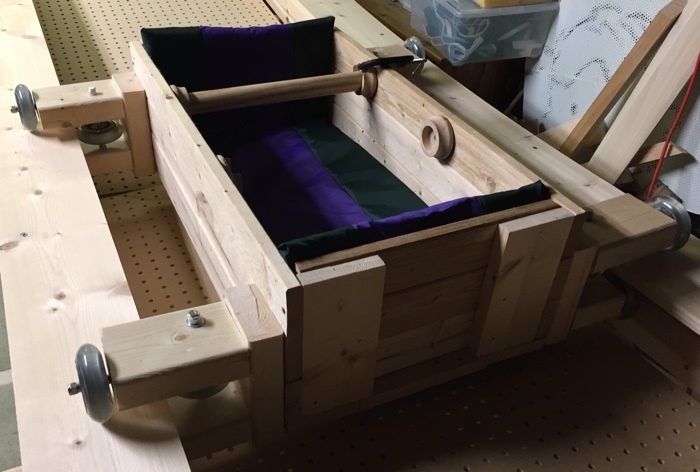 Inspired by the styling on deluxe Radio Flyer wagons, I made some cushions from textured Denier Nylon Oxford fabric, quilt batting, and Muppet foam. For the outside I assembled a sort of fabric tube, which was tricky to feed through the sewing machine. Generous pinning helped. Then I hot glue gunned the foam and batting together. I inverted the fabric tube and slid it over. I folded the ends up like wrapping paper and sewed them up by hand. With a full maximum load, the vehicle nearly reached the other opposite peak after release. Nevertheless, it was important that the vehicle not run off the end of the track, even if inadvertently overloaded or pushed. So I built cradles into the ledger on each end that could accept vertical stop beams. This way, I'd be able to easily remove the vehicle for repairs when needed. 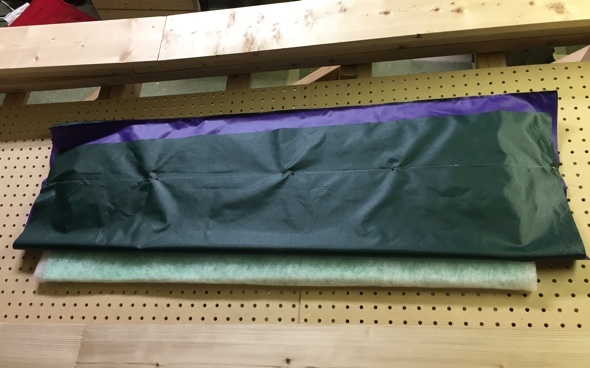 I duct-taped a bunch of Muppet foam to the beams, to dissipate the force of any impact. Kid Coaster has been in regular operation for a month now! I tend to think the best way to understand how something works is to build one for yourself. I do feel like I understand roller coasters better now, but really I just have more specific questions. My next woodworking projects will be to build a derby racer (with my daughter) and a boat. But I find I'm having a hard time bringing myself to dismantle the roller coaster track, to make room.